13+1 Scary DIY Halloween Food Ideas - And All Of These Are Healthy! Halloween parties are always a lot of fun. Trying to decide on the foods that will be served can be a bit daunting. What if the kids have a school party and you have to send in treats? What will you send? Here are some great DIY Halloween food ideas that are both healthy and spooky. 1. Orange Mummies: Very simple to make and they look great. Just wrap some oranges with white streamers to resemble a mummy. Place some eyes on the orange and you have a mummy that is healthy and kids will love. Source recipe here! 2. Frozen Banana Mummies: Another very simple treat are the frozen banana mummies. Cut the bananas into pieces than insert a lollipop stick. After they are frozen drizzle frosting or candy around the banana and then add some eyes. Source recipe here! 3. Hot Dog Mummies: Turn pigs in a blanket into hot dog mummies. Cut the crescent roll dough into strips and wrap around the hot dogs to look like bandages. Add some eye with dots of ketchup and mustard and bake. Kids will love these as a lunchtime treat. Source recipe here! Mummies are not the only great DIY Halloween food ideas. Making food to look like great Halloween decorations is a lot of fun, not to mention that the will be the hit of any office or school party. These are made with dark grapes, raisins and uncooked spaghetti. Just thread the raisins onto the spaghetti legs; you need 8 legs per spider. Put the legs on the spider and you are all done. This is a great party treat. Source recipe here! Just make some candy coated strawberries and add eyes and a mouth from small chocolate chips. When you are coating the strawberries don’t worry about making them perfect. Let the excess drip off and form the bottom of the ghost. Source recipe here! Take some cookie dough and roll it to create a “finger” about the size of one of your fingers. Then you want to shape it to look like a finger. Make a knuckle by making a light bend in the finger and score with a knife. Use red jam oozing out from under an almond for the bloody fingernails. Source recipe here! Make kids enjoy eating vegetables with this special vegetable tray. Carve some red, yellow, and orange peppers to look like a jack-o-lantern. Fill them with the different dips that will be slime and sludge. Source recipe here! 8. Batty Cheese Balls: Another great looking party snack are these batty cheese balls. Just make some small cheese balls, cut up some green olives for the eyes. Next add the wings that are made using blue tortilla chips. Source recipe here! 9. 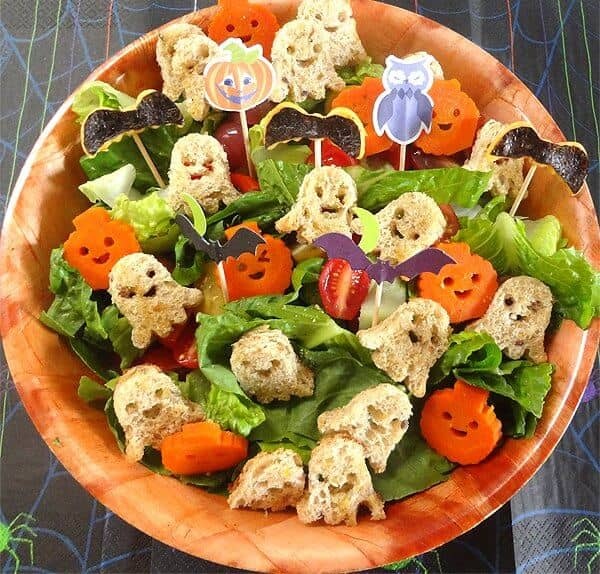 Halloween Salad: A great way to entice kids to eat salad is this great looking Halloween salad. And it is simple to make. You are going to make your own croutons shaped like ghosts. Make small ghost shapes out of the wheat bread. Follow a recipe for croutons. Next you are going to carve jack-o-lantern faces into sliced carrots. Make a salad with your favorite foods and add the ghost croutons and pumpkin carrots. Source recipe here! 10.Monster Zucchini Noodles: Prepare some zucchini noodles and place in a dish and coat them with some pesto. Place them in a serving bowl and make eyes and mouths. The eyes are made with half of a mozzarella ball and black olives. Roast a red pepper and cut it into strips for the mouths. Source recipe here! 11. Healthy Monster Mouths: These are so cute and scary and fun to make. You will need to slice an apple into 4 wedges. You then have to cut the wedge in half, but do not go all the way through, you want it to look like a mouth. Fill the inside with peanut butter. Add slivered almonds for teeth and pipe some red jelly around some of the teeth. If you want you can place a raisin or dried cranberry behind the teeth to look like it is eating a fly. Add eyes by using toothpick. Create the eyes on one point of the toothpick and the other point goes into the apple. Source recipe here! 12. Tombstone Taco Dip: Make your favorite dip and add graves, scary trees, cats, etc. to the dish to make it a graveyard scene. Just grab some different colored tortillas for the shapes. Use cookie cutters to make the shapes or freehand a design and carefully cut it out. Arrange your shapes on the taco dip to create your graveyard scene. Source recipe here! 13. Meat Head: This makes a great centerpiece. You need to get a plastic skull used for decoration. Clean it very well and then wrap it with lunch meat that you cut into strips to wrap the head. Add some eyes and you have an edible scary skull. Source recipe here! 13+1. Watermelon Brain: You need to peel the dark rind off the watermelon. The lighter green rind will be left on the brain. Once you have the dark rind removed you can start to carve your brain. Carve lines to resemble the brain. For some of the carvings, cut in deep enough so that when you remove that piece it will expose some of the watermelon. Source recipe here! Halloween is a great time to have a party for kids or adults. It is also a great time for DIY Halloween food ideas. The foods listed above are all healthy and will look great on a party table. They are also very easy to make. Your kids will love them as snacks or part of their packed lunch.